Ripley Central School, located in rural New York State, is small but strong. Its 167 students in grades preK–6 face similar challenges as students across rural America. But after four years of implementing EL Education’s K–8 Language Arts curriculum and building school culture through small advisory groups called Crews, they’ve discovered that literacy and character are a portal to success no matter where students come from. For years, Ripley Central School was on New York State’s “focus district” list, indicating that students were chronically underperforming in both literacy and math. Seeking solutions, its principal attended a training for New York educators in 2014 and was intrigued by the active pedagogy and complex texts embedded in EL Education’s K–8 Language Arts curriculum. Could this work for Ripley’s students? Ripley leaders invited an EL Education coach to facilitate a workshop with all staff on instructional techniques built into the curriculum that elevate student thinking, voice, and work. From there, the school never looked back. In 2015 they began to implement EL Education’s Language Arts curriculum in grades 3–6, and they instituted daily Crew meetings, in which students circle up with their teacher to learn about, practice, and reflect on the school’s character traits (see the character growth card below). They spent the following year becoming deeply familiar with the curriculum’s detailed lesson plans, and, in 2017-18, deepened their implementation with additional professional development support from EL Education. Ripley’s leaders instituted a systematic, shoulder-to-shoulder approach for supporting teachers as learners. EL Education School Designer Cindy Rice and instructional leaders >unpacked the curriculum with teachers at both a micro and macro level. They examined how the curriculum provides worthy challenges for all students and how the engagement strategies used in the lessons capture students’ attention and foster students’ growth mindset. Teachers practiced protocols for collaboration and close reading and “test-drove” the assessments to develop a deep understanding of what students would know and be able to do at the end of each module. Teachers learned strategies for managing independent reading foundations centers that support students to practice skills that were introduced in the content-based modules. You can see a video of Ripley sixth-graders working in these centers at online. One of the centerpieces of the first year, according to Helmer, was learning techniques for building character at the same time as they were teaching reading. “We embed social and emotional learning into every component of the day.” Teachers created learning targets for each grade level that mirror the school’s character traits. Then they taught students to track their own progress on character growth cards. 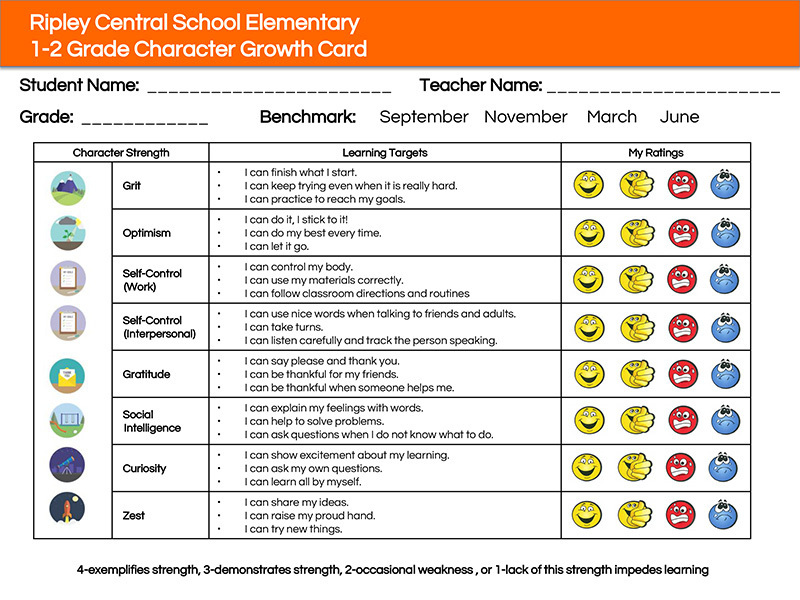 In daily Crew meetings, during behavior interventions, and in conferences with parents, students used their character growth cards to reflect on and set goals, not just for achieving better grades, but also for learning more effectively through collaboration with their peers and persistence in creating high-quality work. “We are a small school and you see the same people all day long, year after year, but strategies like these and restorative practices that start in Crew help us focus on operating like a family rather than an institution,” explained Helmer. The combination of frequent, high-quality professional 4-exemplifies strength, 3-demonstrates strength, 2-occasional weakness , or 1-lack of this strength impedes learning development and an unwavering focus on character through challenging academics enabled teachers and leaders to hold each other accountable and support each other through curriculum implementation. All their hard work began to pay off in 2017-18, when New York granted Ripley high-progress Reward School status—an indicator of high achievement, high growth, and no significant gaps between subgroup achievement levels. Achievement trends over three years for both the overall student population in grades 3–5 and for economically disadvantaged students show a remarkable shift toward proficiency (levels 3 and 4) in New York literacy standards. During the first three years of implementation, the number of students overall testing at or above proficiency climbed from 10% to 32%. Students testing far below proficiency (level 1) fell by 29% (see figure below). Among economically disadvantaged students (75% of students at Ripley), the number of students meeting or exceeding standards (levels 3 and 4) climbed steadily from 8% to 27% in the same period. School network partners: Schools that implement EL Education’s school model and its unique approach to curriculum, instruction, culture and character, assessment, and leadership. Literacy partners: Districts and schools that adopt EL Education’s K-8 Language Arts Curriculum and work with EL Education to support its implementation and impact. 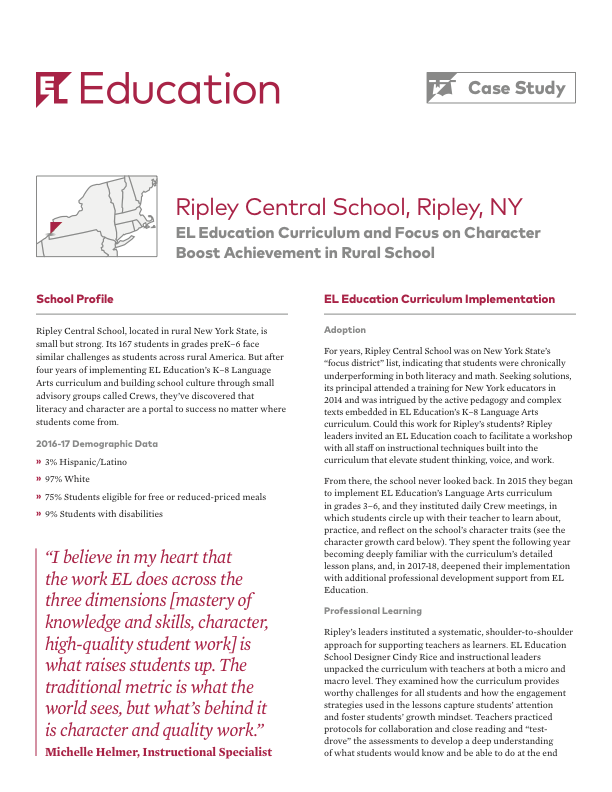 Download the PDF of the Ripley Central School case study here.